Express Collection items may be checked out for free, just like regular library books. Express Collection items are not listed in the library's catalog; this is a browsing collection only. Holds may not be placed on Express Collection items. Express Collection items are not used to fulfill hold requests. The checkout loan period is 14 calendar days for books; 7 days for DVDs. No renewals are allowed. A limit of 5 Express books and 5 Express DVDs may be checked out concurrently. The standard overdue policy applies if Express Collection items are returned late. If any Express Collection items are overdue, your account will be frozen until the overdue items are returned or paid for. 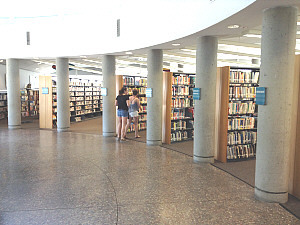 Look for the special Express Collection shelves at the Pacific Beach Library, located in the Multimedia Section, near the library's Cass Street entrance, adjacent to the music CDs.